D-ToolsMVP manufacturers realize the importance of bringing you their product information and have chosen to support the D-Tools user community by joining the program and making their product data directly available through D-Tools SI software. Plan to attend the largest professional audiovisual communications show in the world – InfoComm 2012. 33,000 AV Professionals | 925+ exhibitors | Over 90 countries. Read on for Infocomm 2012 previews from some of D-Tools top Manufacturer Partners. Don’t forget to visit D-Tools at booth #N654! Featuring the latest HDBaseT™ technology, the Atlona® AT-PRO3HD44M 4×4 HDMI matrix switcher extends HDMI sources up to 230 feet over Cat6 cables at 1080p and 1920×1200, or 200 feet with Cat5e cables. The unit allows for effortless control of up to eight devices through IR remote control, RS-232, third-party IR control boxes, and the front panel. The AT-PRO3HD44M has built-in digital audio S/PDIF loop outs that allow audio distribution to an AVR or amplifier. S/PDIF output supports PCM 2-channel, Dolby® 2.0, Dolby Digital 5.1, and DTS 5.1 digital audio formats. To ensure all audio passes through, the 4×4 matrix switcher supports all lossy and lossless formats up to Dolby True HD — including DTS HD Master Audio pass-through for HDMI outputs — as well as 3D signals. The AT-PRO3HD44M will be available in August 2012. In combination with the Atlona® AT-PRO3HD44M 4×4 HDMI matrix switcher, the AT-PRO3HDREC extends HDMI sources, along with IR and RS-232, up to 230 feet over Cat5e/6/7 cable. This unit allows pass-through support of up to 1080p or 1920×1200, along with 3D signals, 2-channel and multi-channel audio, bidirectional RS-232, and IR signals. The Atlona® AT-HDDVI1616-AM 16×16 DVI plus audio matrix switcher is HDCP compliant, offering three control options, nine programmable memory presets, and EDID learning. With switching as fast as .5 seconds and resolutions of up to 1920×1200 or 2Kx1K, presentations of all types will have exceptionally crisp video with the AT-HDDV1616-AM. Powered by RedMere technology, Atlona’s AT-PRO-LCS cables shed 75 percent of the standard HDMI cable bulk. This new cable series is driven by an integrated circuit that passes multimedia data at the same rate as the Atlona flat high-speed cable. The extremely flexible AT-PRO-LCS cables blend seamlessly into any environment without going in the wall — such as behind and under baseboards — simplifying installations and providing integrators with more options in any A/V system design. The cable line is guaranteed to provide stunning picture quality at full 1080p. Designed by Atlona to better accommodate the needs of commercial and residential integrators, the cables are offered in lengths ranging from 20 to 50 feet. The AT-PRO-LCS HDMI cables will be available in July 2012. The Atlona® SDI to PC/HD scaler with audio takes SDI, HD, and 3G SDI signals and adapts them to component or VGA video formats with resolutions up to 1080p or 1920×1200. In addition to re-clocking technology and built in scaling, the AT-HSDI-VGA’s equalized ports extend 3G signals up to 330 feet (100 meters), HD up to 660 feet (200 meters), and SD up to 1,000 feet (300 meters) with no signal degradation. Ideal for side-by-side comparisons, the unit’s built-in loop-out port for SDI signals allows it to simultaneously output to an SDI display and a component or VGA display. For a full A/V experience, the AT-HSDI-VGA features audio de-embedding to pass digital or analog audio through to an amp. Atlona’s AT-PA100-G2 professional stereo/mono audio amplifier offers three inputs: 2 x stereo and 1 x mic. Based on a Class-D digital amplification circuit, the unit can operate in either stereo mode at 2 x 20 W or in bridge mode (Mono) at 1 x 40 W. Built-in EQ control allows users to adjust bass and treble and to mix the mic signal. The AT-PA100-G2 features a ducking function for inputs, while a new power adapter allows for low standby power consumption of 0.4 W. For commercial applications, the unit includes RS-232 control for integration into third-party control systems. The HDVS-WP wall plate video extender and scaler is designed for commercial Integrators with clients using existing VGA sources; especially in educational and enterprise boardroom applications, who are either forced to utilize legacy (VGA) displays, or are upgrading to Digital displays keeping VGA sources, or are upgrading to all Digital displays and need a stop gap solution until all sources are upgraded to Digital output, and are connecting to a remote (+10ft) display or signal pathway. CE labs®/Cable Electronics, Inc. an industry-leading technology innovator of audio/video electronics and digital signage systems, formally invites all dealers, integrators, installers and sales professionals to Booth # N2748 at InfoComm 2012 in Las Vegas, Nv. for an unveiling of a groundbreaking new product that further establishes CE labs’ leadership and forefront position in the A/V and digital signage industries. The company is poised once again to deliver to installers, integrators and resellers unrivaled audio/video options and the latest in digital signage technology. Control4, a leading innovator in residential and light commercial automation systems, is proud to announce its first-ever social media training for Control4 dealers, scheduled to debut on May 15th, 2012. In each interactive training session, Control4 will review major social media platforms—including Facebook, Twitter, LinkedIn, YouTube and Pinterest—to help dealers and distributors gain strategic advice and discover how best to leverage them to build their business. Two live sessions of the Social Media Training Webinar for Control4 Dealers will be hosted on Tuesday, May 15,2012 at 2:00pm MDT and on Friday, May 18, 2012 at 9:00am MDT. The session will also be recorded so that dealers who are unable to attend live can still benefit from the information when it’s convenient to their schedules. Control4 encourages all interested dealers to take advantage of the new Social Media Training Program by reserving a spot today. Draper Inc. is introducing the industry’s first truly sustainable projection screen surface. Draper’s Ecomatt XT700E is the first viewing surface to be Cradle to Cradlecm Silver certified. The Cradle to Cradle Certified® program is a third party, multi-attribute eco-label administered by the Cradle to Cradle Products Innovation Institute that assesses a product’s safety to humans and the environment and design for future life cycles. The materials and manufacturing practices of each product are assessed in five categories: Material Health, Material Reutilization, Renewable Energy Use, Water Stewardship, and Social Responsibility. Ecomatt XT700E is PVC free, and made of 100% polyester yarn. In addition to being fully recyclable, Ecomatt XT700E offers accurate color balance over a full 180° field, and a peak gain of 0.7. Ecomatt XT700E is also GREENGUARD Children and SchoolsSM certified and ROHS compliant. To see Draper’s new Ecomatt XT700E viewing surface in action, stop by booth #C8319 at InfoComm 2012, June 13-15 in Las Vegas. Cradle to Cradle CertifiedCM is a certification mark licensed by the Cradle to Cradle Products Innovation Institute. Sight lines are as important as anything in the home theater. Unfortunately we are forced to make sacrifices in this area. Ceiling is too low for a platform or it’s an existing theater without platforms. In other situations (especially basements) there is no back wall to the theater thus platforms look awkward. Now there is a solution. Fortress’ adjustable seat height option allows you to raise the entire row up 8 inches. This sophisticated control system is combined with heavy duty actuators to physically lift an entire row of seats. The lift is a maximum of 7 inches but can be stopped at any point. This option offers the ultimate flexibility when planning a theater. Now everyone can view the movie from a vantage position and platforms become a choice….not a necessity. On behalf of the dynamic and exciting AV industry, the Women in AV (WAVE) are striving to leave something charitable at the conclusion of the InfoComm 2012 show. “We work in a fast-paced technology industry. We spend a great deal of time and energy at the InfoComm Show in Las Vegas doing business, but we would also like to be good corporate citizens. With all our thanks to FSR President, Jan Sandri, for launching this initiative, WAVE and our industry have the chance to give back in support of a non-profit organization that addresses the challenges women face in balancing work and family responsibilities. ” stated Jennifer Willard, founder of WAVE. non-profit organization provides safe environments in which youth are supported through mentoring, advocacy, education, counseling and intensive case management. They take in homeless mothers and children, pregnant and parenting youth, and provide housing, education, employment training, parenting skills, social skills, etc. We are asking for donations equal to what you would pay for a cab ride or the price of a drink. Of course more would be appreciated! Cash or checks will be accepted (checks made payable to Southern Nevada Children First). Donations will be accepted at the NSCA Women in AV Reception, and at the InfoComm WAVE Luncheon. At InfoComm 2012 FSR, manufacturer of audio and video switching, control products, and connectivity boxes, will introduce enhanced versions of their high-resolution 1 X 2 computer distribution amplifiers that maintain excellent signal integrity while dramatically reducing power consumption. The new CDA-2EQG and CDA-2EQGA, with stereo audio, satisfy applications where a local monitor is needed along with a remote display device requiring a long cable run, such as Conference / Board Rooms, Classrooms, Courtrooms, Staging and Rental, and Houses of Worship. The enhanced models incorporate all of the benefits of their predecessors, including ultra high bandwidth, flat frequency response, local monitor output and second monitor output with integrated line driver and cable EQ. Additionally they feature a “green” automatic power down feature that reduces standby power consumption to less than 50mW, a reduction of over 95%, and an advanced sync output circuit that helps provide reliable display operation even with improperly terminated cables. The CDA-2EQG local monitor output is fully buffered by an independent amplifier stage to eliminate interaction with the remote output that is buffered and equalized to maintain excellent signal integrity with even the highest video resolutions. Signals arrive at the far end of the cable, up to 175’ of standard mini hi-res coax, with almost an immeasurable amount of loss. The CDA-2EQGA incorporates a mini stereo input jack on the front and 5 position pluggable captive screw terminal on the back for balanced stereo audio output. An active audio balancing circuit ensures long, noise free stereo audio cable runs from the point of installation to the sound system. All of FSR’s latest products will be on exhibit at InfoComm, June 13 – 15, at the Las Vegas Convention Center, North Hall, booth N651. Pixim Develops New Imaging Solution Exclusively for IC Realtime New imaging solution based on Pixim Seawolf chip optimized specifically to work with IC Realtime’s new line of DVRs and NVRs. devices. When I-Sniper cameras are paired with IC Realtime DVRs or NVRs, the result is 25-45 percent longer recording times and reduced network bandwidth versus non-optimized third-party cameras. Key Digital is extending an exclusive invitation to all Pro A/V integrators, contractors, consultants, dealers and sales personnel to a personal tour of the totally redesigned Key Digital® booth at InfoComm 2012! Come see our newest additions to the Key Digital product portfolio, and get the rare opportunity to meet industry pioneer and holder of 40 HDTV patents, Mike Tsinberg. Key Digital® welcomes all InfoComm 2012 attendees to join our staff at the Key Digital Booth, Booth #C5438, InfoComm 2012 at the Las Vegas Convention Center, Las Vegas, NV, June 13th – 15th. Understand HDMI? Feel comfortable with how this technology processes and transfers the signals? Want to dig deeper into this format? Then this class is made for you. Taught by industry icon and SMPTE member Mike Tsinberg, this seminar gives you a strong appreciation of the science shaping this important protocol. Learn all about what’s driving today’s HDMI formats and get a peek behind the curtain to glimpse upcoming developments. As always, Key Digital helps you stay on top of this essential part of modern video distribution so you can continue to provide expertise to your customer base. Compass Control® represents the first major control line built from the ground up to use an Apple® iPod® touch, iPhone®, and iPad® as its backbone. By coupling the Master Controller with the control routing capabilities inherent in our Matrix Switchers, this system offers powerful control options including bi-directional IR and RS-232 control, serial and IP feedback, power status sensors, relays, and much more. This 90 minute class introduces the components in the Compass System and details the basic programming process. Learn to use the Navigator software to quickly configure a complete system and utilize the features of the Database Managers. and learn to individualize your control interface to better represent each unique customer system. After exploring the intermediate level topics for the Key Digital Compass System programming, this 90 minute class delves deeper into the capabilities of this extremely powerful programming tool. Explore using Variables to alter the interface, track actions, and trigger events based on feedback. Program the “flick” feature loved by i-Pad users to increase the wow factor of your interfaces. Learn to use feedback via RS-232 and IP to generate interactive control over your favorite products with two-way operation. For any advanced programmer wanting to utilize the abilities of the Navigator software to its fullest, this is a must take class. HDMI, DVI and DisplayPort signals have become the primary AV delivery formats in a digital world. Kramer offers a complete end-to-end solution – the Kramer CORE – for seamless high-definition signal routing, switching, and long distance distribution of HDMI, DVI, Dual Link DVI and DisplayPort digital signals, as well as VGA signals. The Kramer CORE has at its very heart, a truly modular product: the Multi-Format Modular Router. Kramer has introduced a family of three multi-format modular routers, the VS‑1616D, VS-3232D and VS-6464D, with matching input and output boards, including DVI, HDMI and Dual-Link DVI signal boards as well as fiber and Kramer DGKat™ twisted pair input and output boards. These are highly configurable units in which a frame is purchased as a stand-alone frame, to which as many input/output boards can be added or removed. Several Kramer CORE accessory devices can seamlessly and effortlessly connect to the boards in the routers at the heart of the Kramer CORE to provide the ultimate in signal flexibility. These can include Kramer DGKat transmitters and receivers, fiber transmitters and receivers and video scalers. Kramer’s CORE routers also provide flexibility for infrastructure conversion, supporting copper based cabling, fiber cabling or twisted pair cabling which can be used simultaneously. With I-EDIDPro™ Kramer Intelligent EDID Processing™ support, Kramer Equalization & re-Klocking™ TechnologyTechnology™, Kramer Dynamic PortProcessing™, internal test pattern generator and redundant power supply, (VS-6464D only), the products ensure Plug and Play simplicity even in the most demanding environments. The Multi-Format Modular Router family is ideal for customers whose needs may vary from time to time. With modular digital switching solutions from Kramer, your system is always customized according to your AV needs. The VS-1616D and VS-3232D models are currently in stock and available for shipment in the United States. The VS-6464D will be available soon. Contact your local Kramer representative for more information. For information on all of Kramer’s products, please also visit www.kramerus.com. The AM500 supports displays 65″ to 103″ and above and up to 500 pounds (226.8 kg). 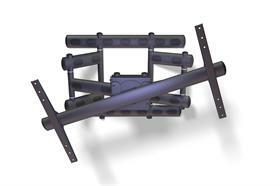 Premier Mounts (www.mounts.com), an internationally leading manufacturer of mounts, carts & stands, and accessories, announces a tremendous addition to the family of articulating flat-panel mounts: theAM500 Mega Mount, capable of supporting displays up to 500 pounds (226.8 kg). A new line of IP-addressable products allow commercial integrators to remotely access, monitor and correct AC power issues more efficiently than ever before. Booth C9536– SurgeX, a leader in intelligent energy management and surge elimination products, is pleased to announce multiple training sessions for InfoComm 2012. As part of their commitment to promoting intelligent energy management, SurgeX will host hourly booth trainings focused on new IP-addressable products being announced just prior to the show. There will also be a session on AC Power, Grounding, and Power Conditioning for AV systems which explores contemporary power management issues and solutions, including the patented Advanced Series Mode® technology. IP-addressable power management products are changing the way integrators deal with AC power, turning it into a time-saver and a re-occurring source of revenue. It starts with outlets that are turned into ports where all IP-addressable products and systems communicate with a central server that integrators have secure access. The server communicates when and why a client’s device or system goes down so it can be fixed as quickly as possible, sometimes without the client even knowing. The server also creates reports of who accessed what jobs and allows customization of logins for added security. This is only scratching the surface of IP-addressable power management potential. Besides the hourly booth trainings, on June 15 from 8 a.m.-12 p.m. in room N260, SurgeX is promoting a session called: AC Power, Grounding, and Power Conditioning for Audio and Video Systems. Attendees will learn practical knowledge such as how to determine when an isolated ground install is required for AV systems and how to handle and prevent pestering ground loops. There will also be an overview of SurgeX Advanced Series Mode technology, a patented surge suppression solution that doesn’t use sacrificial metal oxide varistors (MOVs) as do most surge protection devices. Tannoy, Audica, Lab.gruppen and Lake will be exhibiting together again at InfoComm 2012, taking place between 13th-15th June at the Las Vegas Convention Center, Nevada. With a joint appearance that consolidates their respective expertise in loudspeaker technology, amplification design and processing prowess on one booth, Tannoy, Lab.gruppen and Lake will also be sharing a demonstration room (N109), where visitors and delegates can see and hear the latest product innovations first hand. InfoComm 2012 will see a number of firsts, with Tannoy demonstrating its brand new VLS Series passive column loudspeakers for the first time. Following its successful launch at ISE 2012 in Amsterdam, where it garnered a great deal of interest and positive response from an international audience, VLS promises to be a star attraction in Las Vegas. With transducer technology adapted from QFlex, coupled with an innovative new passive crossover network design, VLS Series is the first Tannoy product to incorporate FAST (Focussed Asymmetrical Shaping Technology), delivering unique acoustic performance benefits not previously seen across a full range of passive column loudspeakers. Delegates will also get the chance to experience Tannoy’s brand new VSX Series subwoofer line – being unveiled in Las Vegas. Developed from the ground up and engineered to deliver high impact, low frequency reinforcement in a compact format, VSX Series models will be versatile performers in either installed sound or portable/live PA applications. VSX Series is the perfect partner to augment Tannoy’s new VX Series and VXP Series full-range sound reinforcement lines in addition to providing low frequency extension for a wide range of Tannoy’s other loudspeaker systems. Leading the charge for Lab.gruppen will be its latest install-centric amplifier range, E Series, which was exclusively previewed at last year’s InfoComm, well in advance of its formal launch. Certified as Energy Star 2.1 compliant, Lab.gruppen’s 1U “green” amplifier platform – incorporating the IDEEA (IntelliDrive Energy Efficient Amplifier) module – combines ample power reserves with amazingly low power consumption, greatly reducing total cost of ownership well below that of conventional designs. Lab.gruppen will also exhibit its class-leading PLM Series (which incorporates Lake Processing technology) alongside the Lake LM 44 (another first view for InfoComm), the brand new standalone Digital Audio System Processor from Lake. These products will showcase how Lake can be integrated into large scale installed digital audio applications such as sports stadiums to offer a greater degree of functionality, integration and security via the use of dual-redundant Dante to distribute, seamlessly, on a digital network. Also on demonstration will be Tannoy’s VX and VXP Series – the extensive line of full-range sound reinforcement loudspeakers introduced last year, the latter featuring an industry first collaboration between the loudspeaker manufacturer and sister brand Lab.gruppen, with the integration of its new IDEEA power module. Tannoy’s wide range of commercial install products including it’s highly successful CVS and CMS in-ceiling systems and recently launched DVS Series surface-mount and OCV Series pendant loudspeakers will all be on live demonstration, as will the company’s flagship large format VQ Series and digitally steerable QFlex systems. On the touring sound front, Lake will be showing the latest iteration of its Lake Controller digital audio processing environment – now at version 6. Significantly for Lake’s existing user base is the advent of new integration potential with market-leading real-time acoustical spectrum analysis software; with Version 6 supporting full integration with both Smaart 7 and WaveCapture’s Live-Capture. Audica Professional will be demonstrating its full range of MICROseries electronics and loudspeakers, designed to offer style and flexibility for background music, commercial AV and audio communication applications. The range consists of the MICROpoint and MICROline wall-mount loudspeakers and the MICROdot ceiling loudspeaker, which fits a standard mini-spotlight 85mm cut-out. All three loudspeakers provide wide-band audio to 70Hz and feature integral wire-through brackets and aluminum enclosures, which are key to performance and styling. Many applications require no additional bass, but for higher level applications and AV the active MICROsub adds low frequency extension and power. The heart of the MICROseries system is the MICROzone, a 5-configuration amplifier/controller that provides unique flexibility for single or multi-location input and control. Comprehensive switching functions enable the unit to be used singly or in multiples in various configurations. For larger systems requiring greater amplifier power, the MICROzone can be used in conjunction with the ultra-compact MICROplus 4-channel power amplifier. The MICROplus delivers 4 × 80W into 4 Ohm, 2 × 80W into 4 Ohm plus 1 × 160W bridged into 8 Ohm or 2 × 160W into 8 Ohm with twin channels bridged. Features include 4-channel limiting and protection and individual channel bar indicators showing output level, clip and fault. The unit has rear-mount level control, phono in/out and screw terminal loudspeaker outputs for each channel. Wisdom Audio and Magnepan, both developers of planar magnetic speaker systems for the home, have joined forces at the upcoming T.H.E Show in Newport Beach, California, June 1-3. Both Magnepan and Wisdom Audio will be demonstrating systems in rooms 221 (Atrium) and Hilton Crystal Ballroom A (respectively), while running advertisements in the show guide mentioning eachother’s company. Magnepan and Wisdom Audio are both leaders in developing planar magnetic transducer technologies, each having a different product history. While Wisdom Audio’s focus has been producing the highest performance speakers available that also allow for architecturally integrated solutions, Magnepan’s MMC 2 is similarly addressing the demand for a high-performance integrated solution that builds on their long history of outstanding floor standing dipole speakers.